Curious about the behaviour, I checked at the next information centre and was told that, for some reason, buffalo just do not recognize motorcycles as anything to worry about. They will get irritated by the noise, but visually, a motorcycle has no impact on them at all. I was reminded of this today when a buffalo-minded pickup truck driver just about rearranged my skeletal structure for me. Yeah, right. Sorry man. The driver was maybe 25, a blond-haired surfer type dude (except there is no surf here and the surfer dude look went out in 1970, but never mind, this is Arnprior). And he really didn’t see me. Which brings me back to buffalo. This guy would most likely have behaved differently if I’d been driving a minivan, but on a motorcycle I was a non-entity. Totally invisible. But what’s even more worrying is that my normally pretty good sixth sense didn’t give me any tingles at all until I had a windscreen full of white half-ton. Have to watch that – it’s not infallible after all. 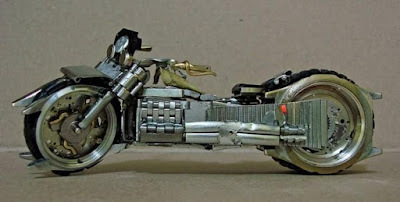 A friend sent me some photos of miniature motorcycles made from watch parts. The images were amazing, as you can see from the picture above, but there was no indication who the artist was. Well it didn't take long (thank you Google!) to discover the artist is a Brazilian sculptor, Jose Geraldo Reis Pfau. Check out his web site for more of his amazing work.